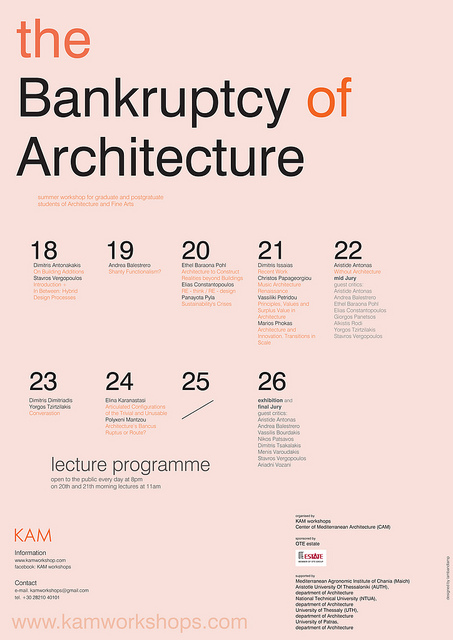 dpr-barcelona was invited to take part at the KAM Workshops 2010: The Bankruptcy of Architecture as part of the mid-jury and also as lecturers in the second day of the workshops. An intensive 10-day studio 18-27 August, Chania, Crete. The program brought together some selected professors and students of architecture and fine arts schools for an intensive 10-day studio work that was focused on the specific theme: the Bankruptcy of Architecture. The sophistication of a poor architecture [that reuses existing material] meets the art tradition of the "ready-made" and of the found object or "objet trouvé". More info at The Bankruptcy of Architecture BLOG, Flickr and twitter.